Posted May 8, 2014 by Eric Graham . 1. Create up-to-date content-rich pages that provide useful information. You have probably heard this a million times by now because it is true! Content is, and continues to be King. Creation of content that is engaging, informative, and relevant to the keywords you are targeting is the number one element to a successful SEO campaign. A supplemental Blog will help to keep things fresh on your site and provide you an opportunity to connect with Google through Google Blog Search as another way to let Google know you are on top of your industry and deserve to be a top ranking site! 2. Optimize pages for target keywords.In the page copy you should include your business name, the location of your business, and the keywords that you are targeting for that page. Pay special attention to the way that you include these words in your metadata and in your on page text. You do not want the copy to be hard to read or have an obvious format of “keyword stuffing”. Limit yourself to 3 to 5 keywords maximum in the metadata and be sure they are relevant to the on page copy. Put your address and contact information in the footer of your site for additional benefit. 3. Create and verify a Google+ / Places page for your business. Check to be sure that your business’s name, phone number, and on-page address are correct on all of your listings. Creating this free listing with Google should on the top of your SEO list. This is your chance to create a Google page that you can link back to your site, include relevant terms and information, get reviews, add pictures, and be included in Google Maps. 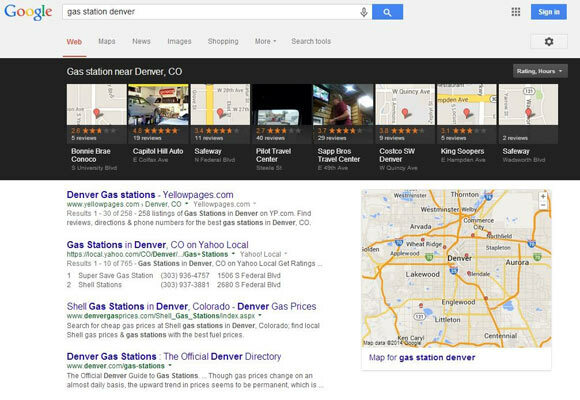 Google Maps listings are often placed in a prominent position on top of the page or near the top. 4. Get Customer reviews on Google+ and other social sites such as FourSquare, Yelp , and sites specific to your industry. Not only can you create a direct link to your site from these profiles but you can work to establish and maintain your reputation. Once you begin to accumulate reviews you will tend to see an increase in click through traffic and a boost to rankings. Be sure to maintain and respond to your customer reviews to show that you appreciate the customer and are willing to resolve and negative issues with your business proactively. 1. Do Not use an excessive amount of keywords in your content or metadata. On that note NEVER use hidden words or links on your pages. You want to focus on only a couple terms per page, anymore than that and your efforts become diluted. When you hide text or links on a page major search engines assume that you are attempting to do something you should not. Any hint of deceptiveness is grounds for an immediate penalty or unlisting from major search engines! 2. Do Not write unnatural or spammy content. If you content looks and sounds spammy it is! People who come across you site and / or listings will shy away from you and go with a company that does not come across as desperate for attention. Don’t do this -> “When you need a Denver Plumber for your Denver pipe leak Trust us for your Denver, CO plumbing services!” Hire a good copywriter with knowledge of SEO if you are struggling on your own! 3. Do Not create Google pages that aren’t related to your brick and mortar address. It will not help you to create additional listings on any listings, review, or map site. This will only serve to create customer confusion and lead to distrust. 4. Do Not pay for anyone to write fake reviews or write reviews yourself. Your online reputation is important to your business’s longevity so do not tarnish it with fake reviews. Fake reviews are easy to pick out, create distrust and will likely be taken down. Customers will appreciate much more you proactively responding to your few negative reviews. 5. Do Not use paid search engine submission programs and mass backlinking programs.Paid search engine submission programs will get your site registered with a mass of unimportant spam sites. Most of these are blocked by Google and will only make you own site look suspect. You are the company you keep! Mass back linking “farms” will only provide you with weak irrelevant and spammy links, none of which will help you in the eyes of the big search engines. Not sure where to get started with your SEO campaign? Contact AMG today at 303-703-8000 to learn more about our comprehensive online marketing services, including a variety of SEO packages to fit your needs and budget.